This was an interesting article Pablo! The chart as advocated by Holden can and is disputed. The differences in charts is rather at the “straining at gnats” level. There are sources that give the ascendant 6°09’ Sagittarius. Holden’s comment, “…no cuspal degrees are given,(Although Alawi in 900 ad and Abu Ma’shar do) but we can assume that the astrologers chose the time when Jupiter was in the ASC degree.” is really speculative. We should never “assume” such tripe because we know from Masha’allah himself, In his “On the Revolution of the Years”, that any ruler within 3 degrees of the Ascendant was strong without question! “If the Lord of the Ascendant were in the horoscope, namely by 3° in front or behind its cusp, not cadent nor removed from the angle of the Ascendant, it will not be necessary with it to look at another planet.” Therefore believing that it “had to be” exactly conjunct the ascendant is nonsense. They would have gladly taken Jupiter 3 degrees before or after the ascendant as long as it did not fall outside of the ascendant sign (or cadent the ascendant). But this just highlights the lack of astrological knowledge of many modern “experts”. But I digress. There is another symbolism in the chart as the capital of the Islamic world at that time. Very importantly Jupiter is the exalted ruler of Cancer and it is the terms of Jupiter in Cancer that were significant to everything that concerned Iraq and the rule of its Caliph and its empire. So it is clear that these astrologers would put the significator of Iraq among the people (the ascendant) in its domicile. Another very important significator of this chart is to look at Venus in Cancer. Venus is the significator of the Arabs…. 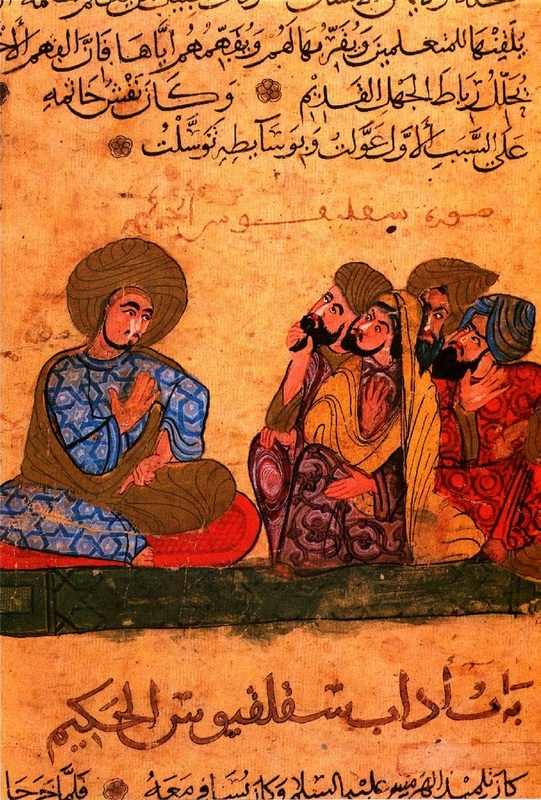 “of Scorpio with Venus for the Arabs…” Why Scorpio? Because the Great Conjunction and the shift of the triplicity indicating the rise of “The Prophet” and Islam was in Scorpio. Venus because she was the lady of the Ascendant of chart of the shift of triplicity (which was 27 Libra). 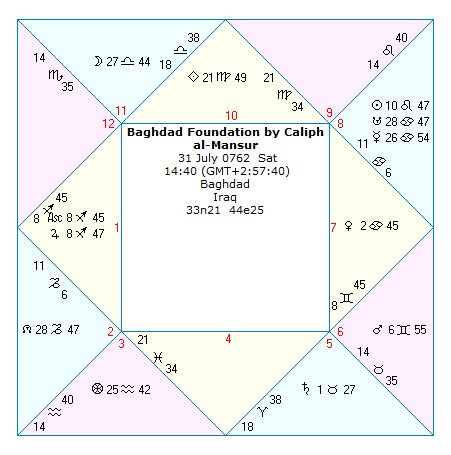 Now in this Chart of the beginning of Baghdad we have the Moon in the degree of the Start of Islam, 27 Libra, separating from the Lord of the Midheaven of the chart (Mercury in the actual chart was in the terms of Jupiter in Cancer) and pushing that disposition to Venus at 2° Cancer and Venus receiving that disposition. Also no coincidence I think that the Moon in the beginning chart of Islam is also in the second degree of Cancer. 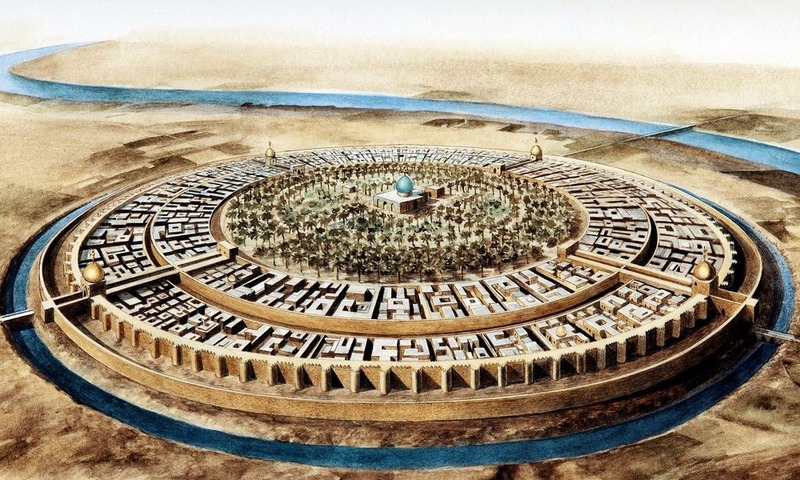 In other words it also established Baghdad as the seat of the power of Islam and its people. Just some extra thoughts on a very good article! Great article Pablo. Interesting to see that on July 31, the sun was exactly shining on Regulus, one of four royal stars. Thanks to both, I’m glad you liked the article. Steven: Disputatio semper bona est!